"A League of His Own" by Dan Abnett, Scot Eaton, Wayne Faucher, and Gabe Eltaeb. The Shaggy Man has landed ashore and begins his smashy-smashy bit in Amnesty Bay. The Atlantean army wants to pursue, but the Sea King orders them to stand down, explaining that if Atlantean warships start landing on U.S. soil, it will trigger another international incident, right at a time when Aquaman is trying to calm things down. 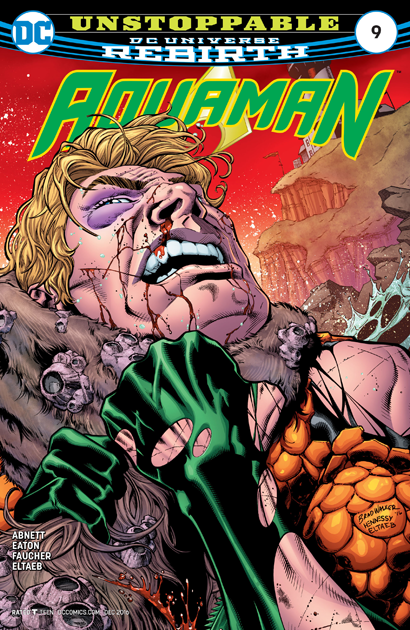 Aquaman takes on the Shaggy Man one-on-one, resulting in a lot of bruises to his face, but not much progress. 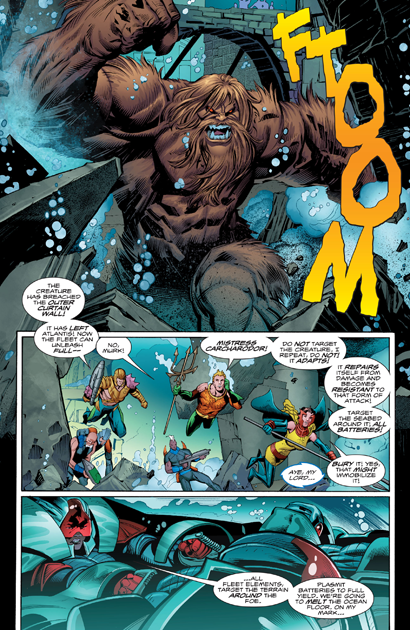 Murk gets involved, demanding to know why Aquaman won't just call in the Justice League for help. It gets heated enough to the point where Murk alleges that its pride that is causing his king to act the way he is, which Aquaman denies. He then tries to his final gambit--he gets up close to the beast, jamming his JLA ID badge in its thick fur. 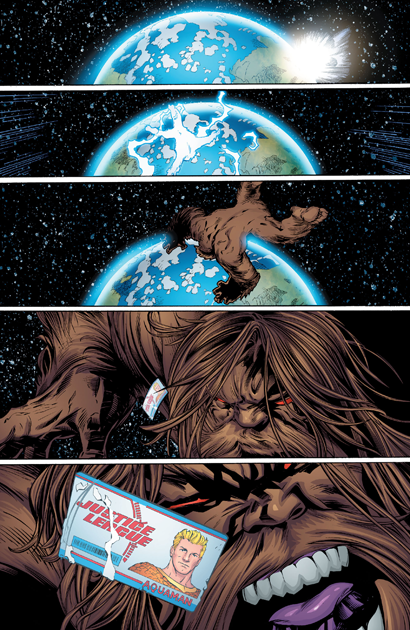 He then issues a command to the Watchtower, and in an instant the Shaggy Man is transported into outer space, where he floats away, helplessly. The conflict now resolved, Aquaman collapses into unconsciousness. To be continued! 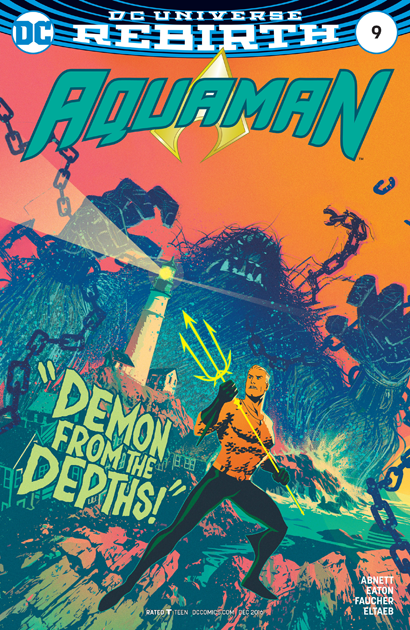 Back in my review of issues #, I was worried that Aquaman was being dragged back into Atlantis, which I was dreading. I am happy to report that was a only a brief stay, and we got a full issue of our hero in his new home, fighting a giant monster. What's not to like? I absolutely loved the trick Aquaman pull at the end. And even though the Shaggy Man is a robot and not truly alive, it still felt really badass for the Sea King to just beam him into outer space. Hopefully he won't get picked up by a Zeta Beam, because that will cause all kinds of problems on Rann. 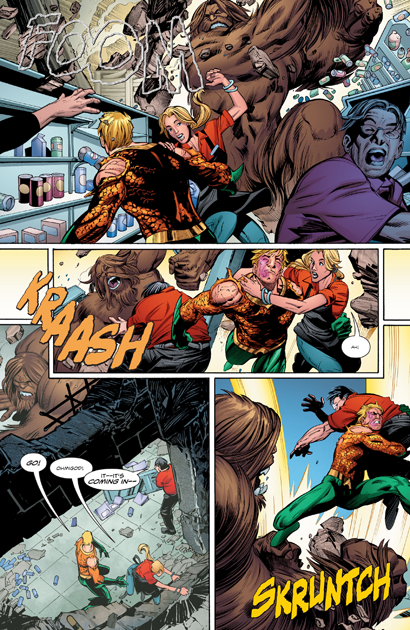 With this issue writer Abnett ties Aquaman strongly to his new home, and we have multiple scenes of him interacting with the locals, only some of which are happy to see him. 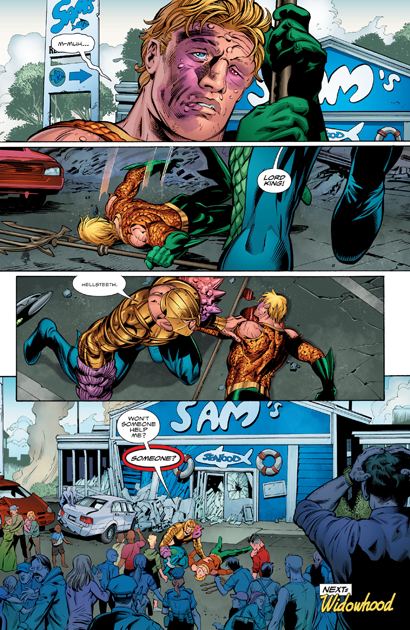 I was very happy about this, as anyone knows who has been reading the Shrine for a while, I loved giving Aquaman a base of operations on land and I hope over time Amnesty Bay becomes something similar to Gotham or Metropolis, the default setting for any story featuring his particular hero. On the art front, Eaton and Faucher continue to do solid work, they know how to do action (good thing!) and there are a number of great shots of Aquaman as he races from one place to the next. I hope we see stuff like this replicated in the movie! Aquaman #9 is on sale now! Actually that would be a good solution to getting rid of some of these unkillable villains. Send them to an uninhabited planet somewhere.